The earthquakes of Calabria are among the strongest in the whole Mediterranean, and they all occurred between the disruptive sequences of 1638 and 1908 (6.7 ≤ M ≤ 7.2). 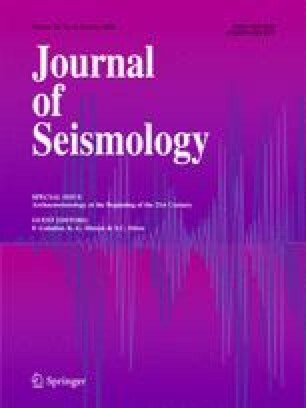 Recent paleoseismological studies show that the return time of these events on their causative fault are larger than 1 ky, thus making ancient earthquakes not recognizable through ‘conventional’ historical research. On the other hand, in those areas characterized by highly erodible deposits, the identification and paleoseismic trenching of active seismogenetic faults has remained a challenge. In order to overcome these issues, we took an archaeoseismological approach for casting light on earthquake occurrence in one of these regions, i.e., the SE area of central Ionian Calabria (Marchesato region). The extensive traces of simultaneous and abrupt collapses in the Roman settlement of Capo Colonna (in the area of the sixth and fifth b.c. sanctuary of Hera Lacinia, near the town of Crotone) are evidence of a disruptive earthquake, which occurred possibly in the third century a.d. To the same event we ascribe the definitive collapse of the Hera Lacinia temple. Considering the seismotectonic framework of the region, this event could be tentatively associated with the active fault system which cuts from NW to SE the whole Sila massif and its Ionian slope, and which should be responsible for all the others known M > 6 earthquakes in the area.